Peanuts, hot dogs, Cracker Jack? Sure! 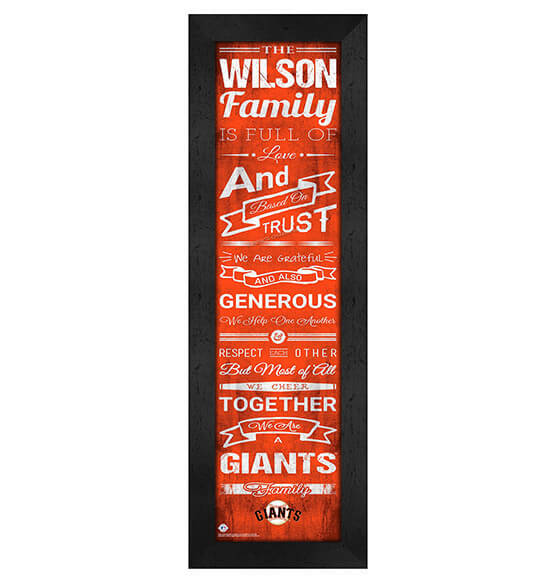 Make a gift-giving occasion even more memorable with our Personalized Family Cheer San Francisco Giants Wall Art. This glass-enclosed, MDF vinyl-wrapped sports decor frame comes ready to hang with a sawtooth hanger on its back. This special, easy-to-customize gift features the team colors of this successful National League West franchise, the SF Giants' logo and a custom saying that signifies your family's strength together. This fine sports decor with a vintage touch is great to purchase for yourself or as a thoughtful gift to the San Francisco Giants fan in your life.